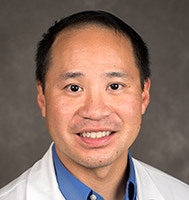 Dr. Liu joined the faculty as an Assistant Professor of Medicine at the University of Wisconsin in 2003, where he currently specializes in genitourinary oncology and experimental therapeutics. Previously, Dr. Liu did his undergraduate training at Dartmouth College, where he majored in biochemical engineering. From there, he received his Master's Degree at Boston University before obtaining his MD at Jefferson Medical College. Dr. Liu completed his internal medicine and oncology training at the University of Wisconsin Hospital and Clinics, with additional training in genitourinary oncology as part of a K12 grant at the University of Wisconsin Carbone Cancer Center. Dr. Liu specializes in the treatment of all genitourinary cancers and is a recognized clinical researcher as evident by his service on the Eastern Cooperative Oncology Group (ECOG) Genitourinary Oncology Core Committee as the Genitourinary (GU) Liaison for the ECOG Developmental Therapeutics Committee, for which he is also a member. He currently serves as the disease group leader for the GU Oncology Disease Group, a NCI-designated Phase II Consortium, and thus is highly active in local, regional, and national trials in all stages of development. Dr. Liu is also a member of the experimental therapeutics (Phase I) program at the UW Carbone Cancer Center, and thus is involved in early drug development.